Have you ever imagined your bodies to be like a robot’s? Detaching a part and replacing it as and when we want to? Probably it would be the best idea for those who wish to get rid of their knee aches and pains. But the complexity of being human is that we know our body parts aren’t detachable and that the more we learn about our body, the more there is left to learn. The way we all understand our body, is that everything is connected. By having basic anatomy knowledge, we can actually help ourselves find the source of our injury and problems. The knee Joint is the largest weight-bearing joint in our body that forms an important part of our lower limbs. It is responsible for the movements of our leg and is basically the foundation on which our body performs complex moves. 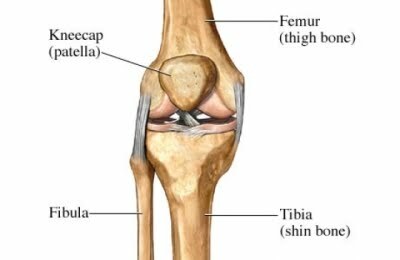 The Knee joint is made of three components; the lower part of the thigh bone (Femur), the upper part of the leg bone or shin bone (Tibia) and the kneecap (Patella). What’s in between the two bones? Between the thigh and the shinbone are structures that provide easy joint movements and prevent the two bones to rub against each other. These structures are the articular cartilage and the meniscus. 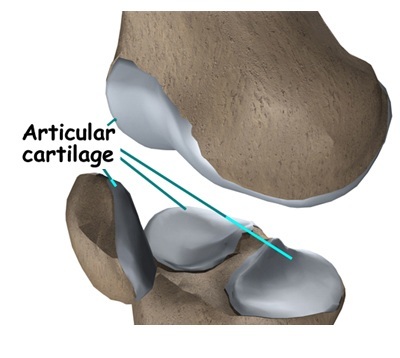 Articular cartilage is a slippery structure on the bone surfaces that help the two bones glide against each other without causing any damage to the bones during movement. There are two thick C-shaped rubber-like menisci that are present between the articulating ends of the thigh and shin bone. 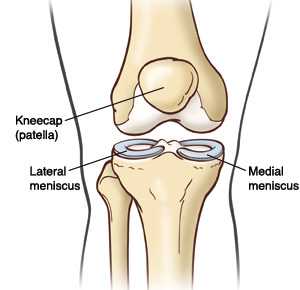 The one on the inner side of the knee is called the medial meniscus and the one on the outer side of the knee is called the lateral meniscus. Both the menisci act like cushion pads and are great shock absorbers preventing weight bearing stresses to affect the knee. The knee joint has strong supporting structures like the ligaments and tendons that help keep the femur, tibia and the patella bones in place. These structures not only support the joint during movements but also prevent any dislocations at the knee joint. These are fibrous band-like structures that connect one bone to another. There are two types of very important ligaments of your knee namely, the cruciate and the collateral ligaments. These are called cruciate because they cross each other in between the thigh and shin bone inside the knee joint. The anterior cruciate ligament (ACL) is the one that is seen in the front and the posterior cruciate ligament (PCL) is present at the back. They hold the two bones, the femur and tibia together when the leg is bending and straightening. 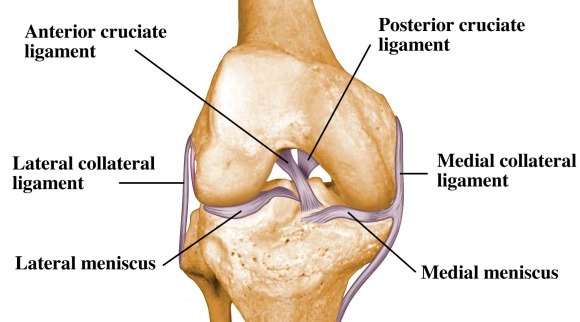 The medial collateral ligament (MCL) is present on the inner side of the knee and the lateral collateral ligament (LCL) is present on the outer side of the knee. Both the MCL and LCL support the knee joint during side and rotation movements of the leg. Muscles end as tendons and attach to bones. Two such important tendons of the knee are the tendon of the quadriceps muscle (the main muscle on the front of the thigh) and the patellar tendon. 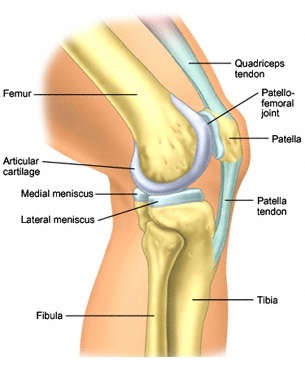 Quadriceps tendon attaches itself to the upper part of the patella bone. While the patellar tendon starts from the lower part of the kneecap to the front of the shin bone. Both the quadriceps and the patellar tendons help to straighten the leg. Knee injuries can happen suddenly or gradually over time. Maybe you’re into sporting activities that require plenty of sharp rotation/pivoting actions of your knee. Maybe you’re lifting weights incorrectly or just lifting too much with poor form. Any such strenuous activities could actually cause damage to the supporting structures of your knee which could lead to painful knee conditions. But sometimes you may not have participated in any strenuous activities at all and yet have knee pains. A simple understanding of this would be that our body acts as a unit and everything is connected, weak muscles and improper mobility around the hip, knee and/or ankle could also create great amount of stress on the knee joint. So always listen to your body and stop overworking your muscles at any given point in time. Of course, if you start having any knee pain, the best thing for you to do is meet the experts who will help you recover and save your knee from further damage.